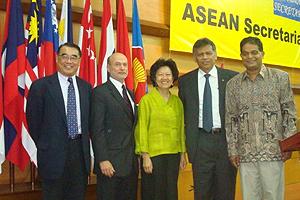 (l-r) Quansheng Zhao, Dean Louis Goodman, Heng Pek Koon, Surin Pitsuwan and Amitav Acharya announced the opening of the first research center on the Association of Southeast Asian Nations in the United States. Southeast Asia is a region of growing importance in global affairs. Home to 600 million people and the world’s third-largest democracy, it claims more U.S. business investment than China and critical shipping routes populate the region’s waters. American University’s School of International Service—in its tradition of heeding President Dwight D. Eisenhower’s 1956 call to train young men and women to “wage peace around the world”—is partnering with the Association of Southeast Asian Nations (ASEAN) to establish the ASEAN Studies Center—the first academic research center of its kind in the United States. The center will cooperate with the ASEAN Secretariat and other members of its network of study centers by conducting joint research, carrying out specialized training, and serving as a venue in Washington, D.C., for ASEAN-related issues. The center’s creation coincides with an increased U.S. interest in Southeast Asia. Recently, Secretary of State Hillary Clinton attended an ASEAN summit and signed the Treaty of Amity and Cooperation, an event that has been in the making for 33 years. The treaty was drafted in 1976 and until now had been signed by 25 nations; the United States is 26. Goodman, School of International Service professors Amitav Acharya and Quansheng Zhao, and Heng Pek Koon, the new center’s director, recently travelled to the ASEAN Secretariat to deepen their links to ASEAN’s emerging worldwide network of study centers. ASEAN was founded in 1967 to promote political, economic, social, and cultural collaboration among the nations of Southeast Asia. Indonesia, Malaysia, the Philippines, Singapore, Thailand, Brunei, Burma (Myanmar), Cambodia, Laos, and Vietnam are its member states.